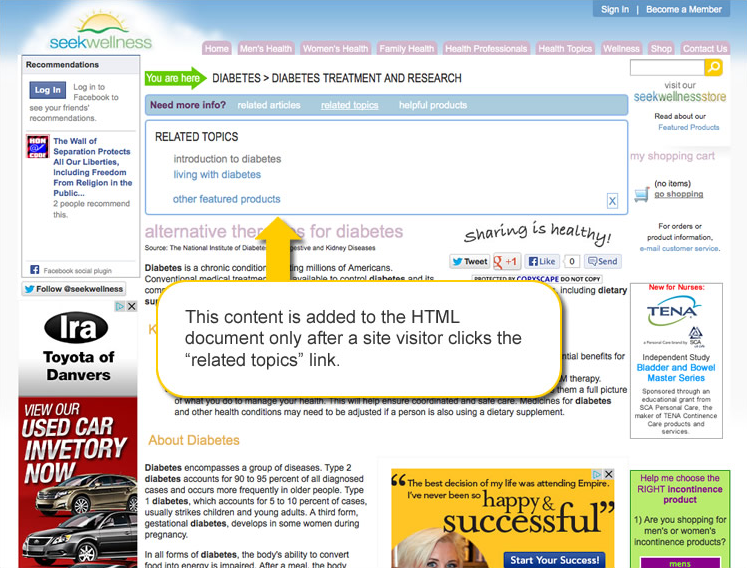 SeekWellness continually monitors their rank in search engines and their online ad campaign statistics and revenue. When examining a recent drop in their Google page rank, they determined that the problem stemmed from their site’s navigation being mistakenly interpreted as duplicate content. Valley Web Design Company replaced their tabbed navigation menu with a sleek AJAX driven menu. It provides their site visitors with the same helpful links and product information as before. The only difference is WHEN that data is added to the page. The data is loaded after someone clicks on one of the links. Why is this important? When search engines crawl your website, they are looking for unique content on each of your webpages. The information should be related to an overall theme, yes, but search engine companies like Google, Yahoo! and Bing don’t want to see the same content over and over again with slight keyword tweaks. Now, picture yourself as a programmer trying to determine which websites are producing quality content, and which are just serving the same page over and over with a few keyword changes. Search engines examine the content of your HTML pages and look for redundant information. So, if you have page elements that repeat across large areas of your website (like related topics and helpful products per a specific category), search engines might mistake that for duplicate content, even though the information in the article is entirely original. So, what do you do? You hire someone who knows what they’re doing (ahem… Valley Web Design Company) and have them program your website so that these types of page elements are not loaded until a website visitor actually needs them. So, when search engines crawl your website, they won’t see these repetitive page elements at all. Genius? You bet!